Bird scooters may be perceived as a public nuisance, but as a company they are working to change that perception. Bird recently came to an agreement with the city of Santa Monica regarding safety and compliance with city regulations. According to the Santa Monica city website, on February 14, Santa Monica City Attorney’s Office prosecutors entered a plea agreement with Bird Rides, Inc. and Travis VanderZanden (collectively “Bird”), whereby Bird will accept responsibility for violating local law and pay significant penalties. These are all positive steps, but the reality remains that many people will continue to ride birds without helmets. Birds provide a convenient way to move just a few blocks when you may have been planning to walk. Pedestrians don’t always have helmets with them, so this will be an obstacle Bird will have to overcome. The Santa Monica Police Department has begun an active campaign of stopping riders and informing them they are breaking the law. One junior at Santa Monica High School was stopped by police when riding a bird just a few blocks without a helmet. The fine for riding without a helmet is $190. He was not cited, but he was warned. Bird scooters are a convenient transportation option for students, particularly if they only need to go a short distance. They don’t have to own anything, they don’t have to pay for parking, and they don’t have to return anything to a specific location. Although 18 is the official age for ridership, that doesn’t stop younger teens from riding. Adults on social media have expressed frustration at kids not following safety rules and the random abandonment of Birds along the sidewalks, frequently referred to as “littering.” There’s not much Bird can do about that as a company. Bird has made an effort on their website to stress safety, helmet usage, and appropriate parking etiquette. 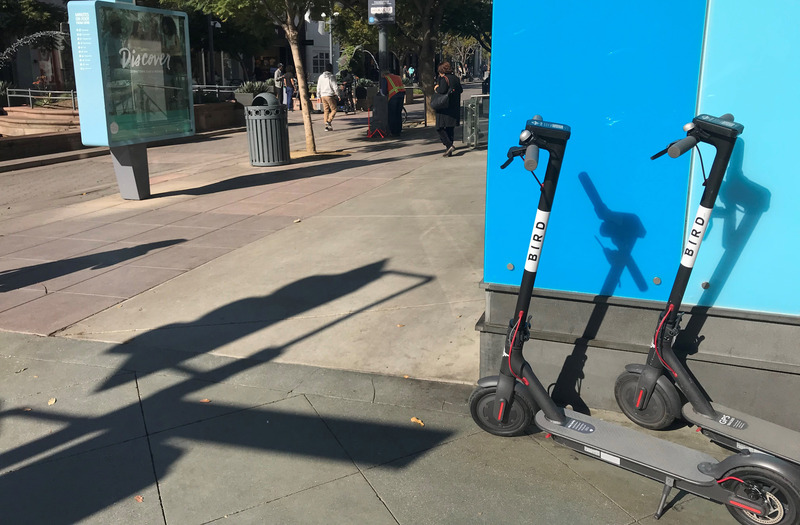 Additionally, Bird has lowered the maximum speed of its scooters to 15 mph from 22 mph in order to make them safer. It seems that Bird scooters are here to stay. They are fun, convenient methods of transportation. Hopefully they will remain safe as well. Yesterday I had to move off the sidewalk to make way for a scooter carrying two people on it, going downhill at top speed. This is not my idea of a “walkable city”. If people would only obey the law and stay off the sidewalks! The company recently put a sticker on the scooter listing safety requirements but staying off the sidewalk was omitted. It seems that good manners and common sense will not be enough to solve the problem.